In the previous three parts of this series (Part 1, Part 2, Part 3), I covered calibrating and profiling, how to use standard test images effectively (especially when viewing images on monitors), the importance of controlling your lighting when evaluating prints, and how to do print testing fast and affordably. In this article I will explain specifically how to move test images precisely on a page in Photoshop or Photoshop Elements. In Part 3 I went into detail about why a small standard test image such as the one I have available on this page is very helpful for matching your screen to printer or lab. As I noted, the test image is 3.25×3.46 inches at 275PPI (a good size for quick testing), and the 275 PPI resolution works well for most printers, including inkjet and popular photo lab printers. Another version of this test print, sized to fit on a 4×6 canvas and tagged with the sRGB working space, can be found here. It’s ideal for sending to photo labs to see how neutral their neutrals are printing, and you can also see how their output compares with your screen. Just be sure to have them turn off all color correction. Most labs give you a choice. 1. 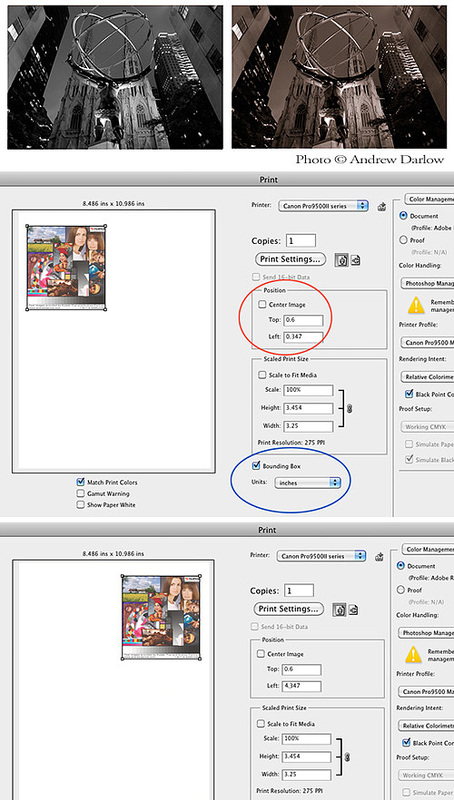 After Choosing File>Print (or in some versions of Photoshop: File>Print w/ Preview), Choose Page Setup (File>Print Settings In Photoshop CS5) and choose your printer as well as the page size (in this case, Letter). 2. Uncheck “Center Image” (circled in red, above). 3. Check “Bounding Box” (circled in blue, above). 4. Move the photo to the upper left-hand corner of the page and print the test image (using proper color management). 5. After you examine the results, take notes regarding the settings used to create the print, such as Paper Type, Profile, etc. (tips on that will be covered in more detail in Part 5). If you’d like to make another test print, repeat the process, but this time, move the image over to the right corner of the page. You can do that by clicking on and dragging the preview image, or by entering a number in the box next to Center Image. Leave at least .5 inches of space from the margins to reduce the chance of cropping onto the photo. The numbers in the box next to “Center Image” indicate the X and Y coordinates of the top left corner of the image. 6. When printing to most printers, the image will come out “upside down” so you will need to turn the sheet 180 degrees when you reinsert it into the printer for further testing. To clarify, the image should be be upside down and in the bottom right corner of the paper when you place it back into the printer for a second test print. 7. In the sample workflow above, you can get at least 2 more test prints out of a single sheet of paper. If your paper is double-sided, you can make twice as many test prints. Both Lightroom 3 and Aperture 3 allow for very similar image placement, and both allow you to print directly to most printers in ways very similar to Photoshop. The reason I chose the image of Atlas in front of St. Patrick’s Cathedral in New York City in both black and white and sepia is because I like to add those two photos to some of the larger prints I frequently use for print testing. I recommend adding a neutral black and white and sepia-toned photo of one of your images, or you can do testing with just black and white and toned images. The neutral image helps a lot to see how neutral the prints are that you are making, and it’s also helpful for judging detail and sharpness. Just make sure that the neutral photo is perfectly neutral (Red, Green and Blue values should be equal from 0-255), and as I explained in Part 1 of this series, it is essential to view your proofs under proper light or the whole system breaks down. You can find links to many more color and black & white test images on this page (under L2.2).